Go Green! Control Japanese beetles and kill grubs up to 20 years with one application! Adult Japanese Beetles, in large hordes, voraciously devour your plants, shrubs and trees. The white grubs of the Japanese Beetle feed on the roots of grass and plants. Milky Spore is a naturally occurring, host-specific bacterium (Bacillus popillae) and is lethal to the white grubs of Japanese Beetles. Milky Spore requires only a one-time application once the soil has warmed. The grubs munch up the Milky Spore and die. As the grub decomposes, it releases billions of new spores into the soil. Milky Spore is not a poison. 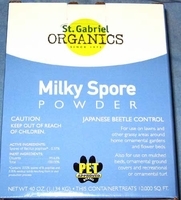 Milky Spore is not harmful to beneficial insects, birds, bees, pets or man and is approved and registered with the EPA. Milky Spore will not affect wells, ponds or streams and is compatible with lawn chemicals. Once established, Milky Spore can last up 20 years, manufacturer 10 year performance guarantee. OMRI (Organic Materials Review Institute) listed, for use in organic production. 10-year manufacturer guarantee when applied as directed. Milky Spore is in powder form. 40 ounces covers 10,000 square feet. Pricing per 40 ounce box. Case size is 4. Made in USA. Manufacturer: St. Gabriel Organics. For more information, see "Japanese beetle" in the Glossary. 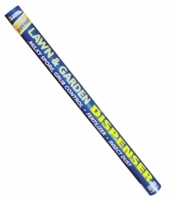 Dispenser tube for Milky Spore Japanese beetle control powder, ant dust, flea dust, tick dust, fertilizer, driveway ice melt or salt. Dimensions 32" x 2-3/8", removable cap on filling end and adjustable shaker/open on business end. Application instructions on side of tube. Made in USA. Manufacturer: St. Gabriel Organics. Go Green! Control Japanese beetles and kill grubs up to 20 years with one application! Adult Japanese Beetles, in large hordes, voraciously devour your plants, shrubs and trees. The white grubs of the Japanese Beetle feed on the roots of grass and plants. Milky Spore is a naturally occurring, host-specific bacterium (Bacillus popillae) and is lethal to the white grubs of Japanese Beetles. Milky Spore requires only a one-time application when the soil has warmed. The grubs consume the Milky Spore and die. As the grub decomposes, it releases billions of new spores into the soil. Milky Spore is not a poison. Milky Spore is not harmful to beneficial insects, birds, bees, pets or man and is approved and registered with the EPA. Milky Spore will not affect wells, ponds or streams and is compatible with lawn chemicals. Once established, Milky Spore can last up to 20 years; manufacturer 10-year performance quarantee. Milky Spore is in powder form. The 10 ounce covers 2500 square feet. OMRI (Organic Materials Review Institute) listed, for use in organic production. 10-year manufacturer guarantee when applied as directed. Made in USA. Manufacturer: St. Gabriel Organics.